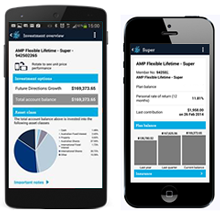 You can easily access your finances, wherever you are, with AMP's digital solutions. Manage money while you're on the move with our mobile app. 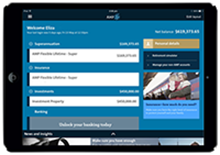 Explore financial options from the couch with our tablet app for iPad. Access your finances on the move. Your super, banking, investments and insurance all at your fingertips. Set up Quick Balance for AMP Bank customers. Explore your finances. Get the bigger picture of where you are now and where your financial choices could take you. And change direction at a touch. Calculators show you different financial scenarios. Any advice on this website is general in nature and does not take into account your personal circumstances, objectives and needs. Therefore, before making a decision, you should consider the appropriateness of the advice with regard to those matters. Please see our Financial Services Guide for more information.